Hollis Taggart Galleries is pleased to present the Abstract Expressionist works of Audrey Flack, renowned painter and sculptor. On view for the first time as a cohesive group, this rare body of work highlights the artist’s powerful modernist imagery and illustrates her unique position within the Abstract Expressionist movement. It was through Abstract Expressionism that Flack forged her artistic identity and created highly original work that was structurally ordered yet gestural and captured the core sensibility of the age. Though today best known for her stunning Photo Realist paintings, Audrey Flack first came to artistic maturity among the vibrant downtown scene of Abstract Expressionism. Flack was a regular at the 8th Street Artist’s Club and the legendary Cedar Tavern, where she shared ideas, argued over philosophies and was part of the impassioned art scene. Flack was still attending Cooper Union when she developed ties with such art world luminaries as Willem de Kooning, Jackson Pollock, and Franz Kline. 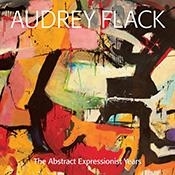 Flack is one of the last living links to Abstract Expressionism. Featuring over twenty paintings, produced largely between 1949 and 1954, Flack captures the passion, spirit, experimentation and idealism of the time. As a whole, this exhibition reveals an important period in Flack’s career while also providing a crucial stylistic and conceptual basis for understanding the importance of her later Photorealist work. 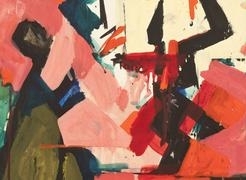 Flack’s Abstract Expressionist compositions highlight the artist’s masterful marking techniques, her consummate draftsmanship, and unique gestural language. The deconstructing and restructuring of the object, the all-over composition, and the intense energy that infused her Abstract Expressionist works are factors that make her unique among the Photorealists. This exhibition of Flack’s midcentury works illuminates and contextualizes her significance as an Abstract Expressionist. Audrey Flack: The Abstract Expressionist Years is accompanied by a fully illustrated catalogue with an introduction by noted art historian and critic Irving Sandler and a comprehensive essay by scholar Robert S. Mattison. Mattison is the Marshall R. Metzger Professor of Art History at Lafayette College and author of Robert Motherwell: The Formative Years (1987), Grace Hartigan: A Painter’s World (1990), and Arshile Gorky: Works, Writings (2010).